Spring is upon us and with the increase in pollen and other allergens, those horses with prior respiratory allergies can flare, creating a life of misery for them and their owners. Respiratory conditions impact a large percentage of horse community, contributing to health problems ranging from poor performance to complete debilitation. Chronic obstructive pulmonary disease (COPD) is one of the most common respiratory conditions affecting the horse, which can be frustrating to manage. Just like other health conditions in the horse, the more we know and the earlier we intervene, often the prognosis is improved and management made easier. Equine allergies are a common problem, often impacting up to 20% of horses. Respiratory allergies are also common, likely ranking next to skin allergies, manifesting in clinical problems from inflammatory airway disease to chronic obstructive pulmonary disease. The key to all of these conditions is understanding that they are allergies on some levels, resulting in an dysfunctional immune response and increase in systemic inflammation. No matter if we are dealing with skin or respiratory allergies, the underlying pathways are very similar. COPD or chronic obstructive pulmonary disease in the horse can manifest in different forms, often dependent on what stage the condition is presented. 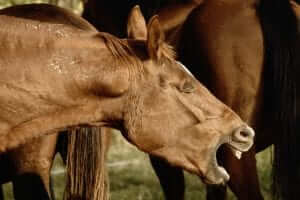 In early stages, the horses are often seen as having an intermittent cough, often made worse with exercise. In some cases, the cough is productive, meaning that there is phlegm produced and maybe resulting in a nasal discharge. There may be a connection with dusty or dry conditions, or even with dusty hay which seems to make the cough worse at times. As the condition progresses, the cough becomes more common or noticeable with the horse coughing more consistently with our without exercise as the instigator. Allergies can become progressively worse as time goes by and each season of antigens presents itself. The process of inflammation becomes progressive, resulting in higher levels of cellular damage, often making the act of breathing more and more difficult. In those cases, the horse has to put more and more effort into breathing and often develops a ‘heave line’ which is present on the abdominal wall and is reflective of increased muscle development secondary to increased effort in expelling air. Those same horses often have flared nostrils consistently throughout the day, reflecting the increased effort in breathing. COPD is an allergic condition and thus there are many antigens such as pollen, dust and dander which contribute to the response. Allergies are really a dysfunction of the immune response, in which case the immune system is failing to discriminate between life threatening invaders and more just bothersome antigens. In the case of an allergy, the immune system detects the antigen or foreign invader and over reacts, almost acting as if it is a life or death situation. As a result, the immune response releases many cytokines into the bloodstream and local area, which can alter blood circulation, constrict airways and create swelling. Phlegm is often produced secondary to a defense mechanism by the body, attempting to contain the pollen or other antigen and slow measures down. When overproduction of phlegm is combined with constricted airways, air movement can be dramatically impacted. One of the biggest things to keep in mind is that uncontrolled inflammation is very destructive and over time, cellular damage and scar tissue occurs, creating changes which cannot be reversed and continue to create problems for the patient. Just like other allergies, C.O.P.D is often worse during high pollen or allergen times of the year, thus usually worse during Spring and Summer months. Likewise, during these times of the year, heat and humidity are often elevated and also contribute to the problem. It is not uncommon to have a COPD patient become more stable during cooler months or just after a rain, as the pollen counts are decreased. Likewise, it is not uncommon to have a stable patient quickly deteriorate during a hot and humid day. The heat adds to the inflammation present within the body and the high humidity adds more moisture to an already high phlegm state of being. In most cases, the bloodwork is unremarkable but may indicate possible presence of infection, which is not uncommon with these patients. The reason for this increased respiratory infection risk is that they are not clearing their airways properly, thus bacterial tend to accumulate in the perfect environment. If an infection is present, it is not often the primary problem but more so a secondary contributor. A TTW or BAL is often very helpful in making the correct diagnosis. In these procedures, we are able to gain fluid from the airways and evaluate by culture or microscopic examination, determing which cell type is present. In cases of allergies, the most common cell type is the Eosinophil, which is an immune cell that predominates in times of an allergic response. Considering that COPD is an allergic condition, the two main arms of treatment are to reduce inflammation and modify the immune response. In most cases, the condition is seen as an over-active immune system, which is correct in one respect but incorrect in another. Antihistamines tend to be poorly effective in most patients, in my experience. Their lack of efficacy is likely more related to the condition being more late stage, with evident progression. Antihistamines have the sole goal of reducing the amount of histamine release by Mast Cells, which are a type of immune cell. Histamine is the chemical that is responsible for itching and increased mucous production in allergic responses. It is just one small aspect of the immune response, but an important contributor to clinical signs. Corticosteroids are very commonly employed either by oral, injectable or nebulizer form. Their main function is to decrease the inflammation that is present and secondarily to actually decrease the immune response. They can be very effective, especially in early stage conditions, but their effect is limited by dose and the higher the dose needed, the more potential there is for side effects including ulcers, liver problems, kidney disease and even secondary infections due to immune suppression. Bronchodilators are also commonly used to help open the airways to ease breathing. They can be effective, again especially in early stage conditions. Side effects include cardiac stimulation with increase in heart rate and blood pressure, which can be lifethreatening especially during exercise. We have to remember that most of these medications do very little to manage the cause of the condition and in most instances, act as bandaids holding back the dam. As the condition progresses, which it will, more damage occurs and higher doses of these medications are needed to control clinical signs. If we step back and really look at COPD, just like any allergy condition, we can gain a better understanding and open doors for enhanced management. First, as with most health conditions, the earlier we intervene with any therapy, the better the options for the long term. Early diagnosis and intervention are critical. The immune system is known to be based out of the gastrointestinal tract for many reasons. In allergic conditions and COPD, we have an over-responsive immune response, so it makes sense that the problem with the immune system might stem back to the gut in some respects. If we dig deeper and step back from the patients, we the realize that most of the active COPD patients could be classified as ‘easy keepers’, in which case, most easy keepers have underlying GI problems stemming to hindgut concerns to poor nutrient absorption. With this approach in mind, focusing on the immune response, it makes sense to target the GI tract trying to improve or balance the immune response while also curbing or controlling the inflammatory reaction. In Eastern Medicine, phlegm or mucous accumulation is often reflective of poor digestive capabilities, which again helps to reinforce the philosophy that the GI tract is where our target should be. In our patients, we have had great success in using our Cur-OST® EQ Total Support formula in combination with the Cur-OST® EQ Immune & Repair. The EQ Total Support utilizes several herbs, including Curcumin and Boswellia, to help promote a healthy inflammatory response, but the formula also uses three key herbs to target GI health and reduce phlegm accumulation including Dandelion, Marshmallow and Parsley. The EQ Immune & Repair formula utilizes micronized mushroom beta-glucans to help balance the immune response, but also includes vital amino acids to help combat oxidative stress and promote cellular repair. The two formulas work very well together in these cases and it is not uncommon to have a reduction in medication demands for the patient as healing occurs and balance is restored. In many of these patients, we will also try to reduce allergen loads by watering the hay to reduce dust, reducing the allergens in the diet and even changing turnout regimens to accomodate their needs. The patients are so ‘hyper-stimulated’ in the immune response, that ideally we want to reduce or eliminate processed feeds which may contain high levels of additives, sweeteners, dyes or preservatives…all of which can contribute to the problem on an immune and gut level. Moving towards a more natural and detoxifying diet makes sense and can really assist us in managing them easier. In the end, COPD is a progressive condition. The condition is really present throughout the year, but only appears to be a problem for most during high allergen times such as Spring or Summer. It is essentially like a pool that is close to overflowing, but just sitting below the rim. In the Spring or Summer, allergens come and force that condition over the edge and cause an overflow. If we get to the root of the problem and manage it throughout the year, instead of just during high times, then the condition can become easier to manage and actually allow us to buy time during the off season to allow the body to heal. If you take a more complete approach with more understanding, then the possibilities are endless. I hope this information helps as this is a common and serious condition impacting our horses.